Happy Friday All and hope your location is not like New York with 61 degree temps, heavy rain & flooding conditions. Friday is my driving day and it was a congested rainy & flooded mess this morning, and did my darndest to avoid taking off someone's bumper. Then to top it off, get on the train and there is water dripping inside... so I couldn't sit in my usual seat.... drats.. the life of a New Yorker on a rainy day. However, I took Casual Friday seriously and donned Loft trouser jeans, one of my favorite tops Simplicity 1849, 9West b/w patent loafer and topped off my pic with a virtual waterfront view...lol. 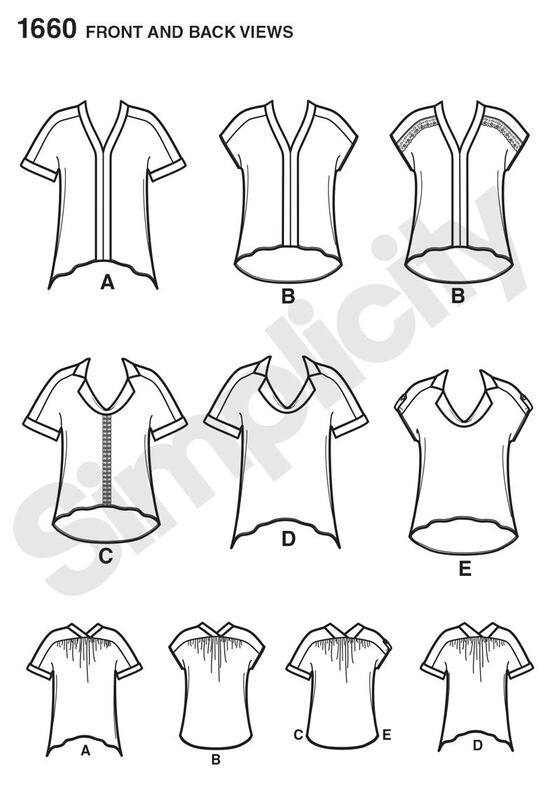 Psst.. if you haven't sewn Simplicity 1849... add it to your to-sew-list. 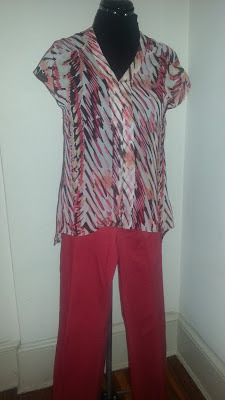 The top is perfect for pairing with a skirt or slacks or jeans and most importantly figure flattering. 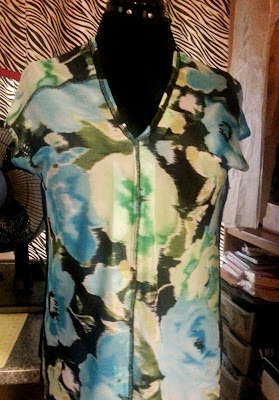 I made several of them last year, but had to make more in that the first ones I sewed were long sleeves, and last summer ended up shortening the sleeves to pair with shorts. So this year I had to make more in long sleeve. This version was done in a vibrant purple rib knit, perfect for an overcast & rainy day. Pattern Review: Simplicity 1660, Version B. 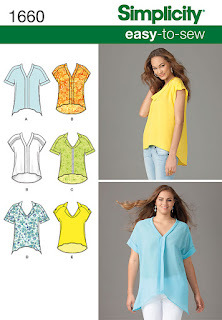 Pattern Description: Misses & Plus Size loose fitting tops Pattern Sizing: xxs - xxl Did it look like the photo on the pattern envelope: Yes, but not as loose fitting. Were the instructions easy to follow: Yes, the instructions were easy. 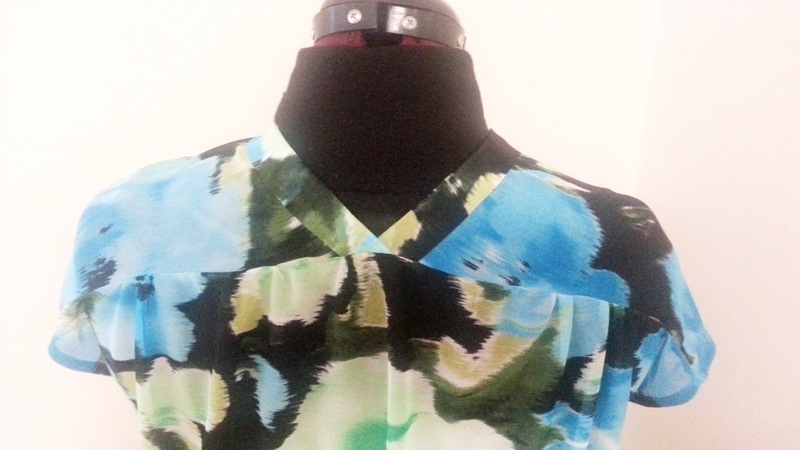 However, initially I became befuddled when the yoke did not fit the top of the bodice. 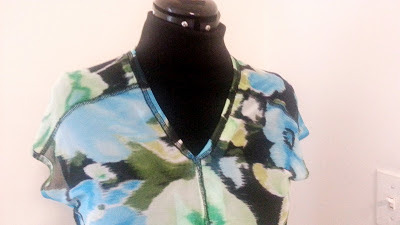 While talking to Rachelle and discussing my woes about the pattern, she made me realize that I may have cut something incorrectly and sure enough I had cut the shoulder line at a large when the yoke was cut for a small. 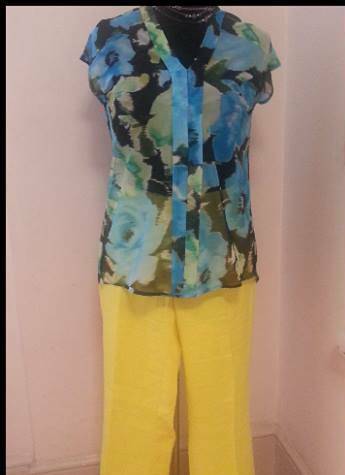 What did you particularly like or dislike about the pattern: I like the exposed facing detail and the high-low hemline. Fabric Used: Sheer floral fabric. Pattern alterations or any design changes: None, but will say that the pattern runs big and make sure to check the finish measurements on the pattern piece. Would you sew it again / Would you recommend it to others: I immediately made another one and extended the back. However, I have reservations about the second one... just can't put my finger on what it is. 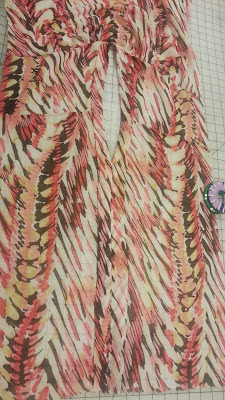 hem lines were folded under twice and single stitched. Enjoyed wearing the top and quickly moved onto another one. 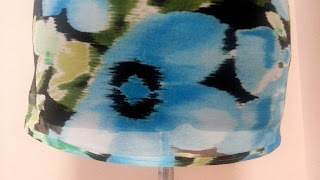 Here it is laid flat after attaching the facing and before sewing up the side seams. With the weather turning cool, I haven't had the chance to wear the second one out & about to get a better idea of why I have reservations about this version. So for now it will be worn by Ms. Mannequin. Well until then ... Every A Great Weekend. Both versions of the top look great! I eyeballed this pattern at the last pattern sale, but did not get it. I may have to pick it up now. Happy Friday. Love the purple top and the floral blouse. Not sure about the second blouse,maybe is the added lenght. Both are so cute. 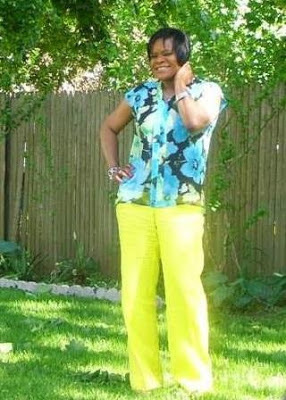 I love the bright pants for summer. After participating in Me Made May, I realized that I need to get some summer pants in my wardrobe. Those are cute tops, thanks for the inspiration. I hope the rain stops and the flooding recedes. Adelaide, definitely pick it up. Alethia, yes something is definitely amiss with that top. Lori, the rain has finally stopped... yeahh. Glad to see that your trip to / from work was a safe one. What a mess it was yesterday. You look lovely against the virtual backdrop. I like the first sheer tunic length much better. I think lengthening the back on the second one definitely threw off the proportion and probably made you feel shorter if you know what I mean (hopefully I am explaining it correctly). Great work as usual and keep looking sassy my friend! Beautiful outfits Sheila! 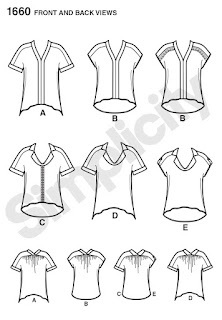 Love your tops. I love how you make more than one piece at a time! Friday was HORRIBLE and that was a great outfit for such a soggy day! Thanks Carolyn. Yes Friday was horrid and going home was worse, but thankfully today is better. Thanks Rhonda. It took me a while to jump on the bright pants train, glad I finally did. Now trying to work my way to fancy pants. I love both of them, too. Probably the second one is my favourite! i can't do summer pants in my area, it's way too hot! I just bought 1660 too, and was looking for other people's review when I found your site.... YAY!! You have so much great info and pictures, you write well, and you have a similar style to mine - perfection lol :) thanks for the post, you have a new reader!! Hi KAJ528 and glad the review was helpful and thanks for becoming a Reader... truly appreciated. I'm glad to have missed Friday's weather too. Top heaven...this is top heaven! Love both of your tops!